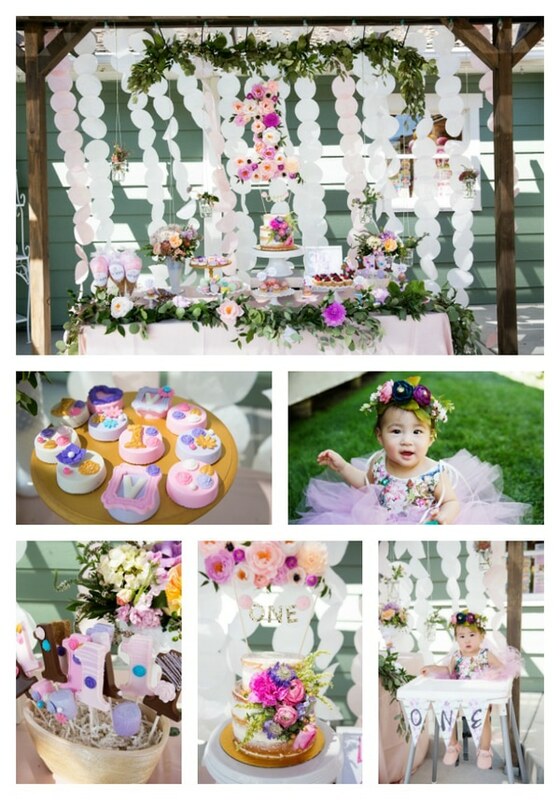 Every little girl deserves the very best for her first birthday and this sweet party definitely delivered the goods! 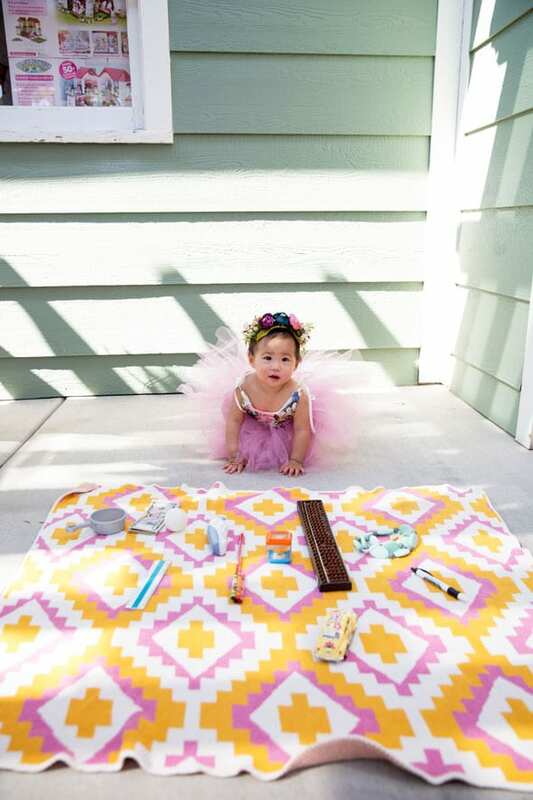 Who wouldn’t love a 1st Birthday Garden Party? 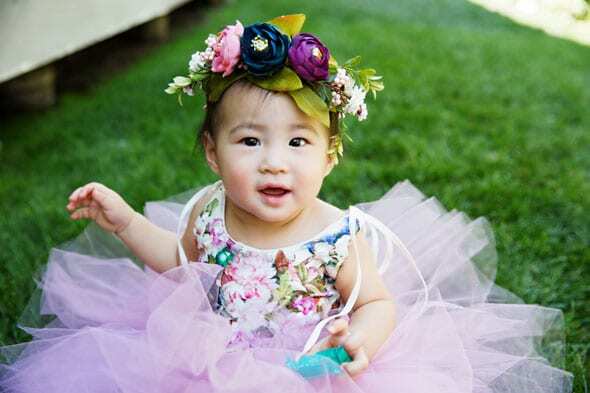 By creating a sweet girly background with gorgeous flowers all around, nothing could beat the perfect day that was in store for this little birthday girl! Sandy from Sandy a la Mode sent in this gorgeous party for her daughter. 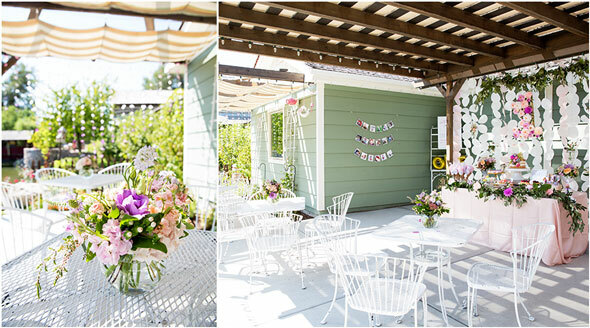 Look at that beautiful tablescape for this garden party! With the beautiful greens and flowers that complimented the simple and classic white tablecloth from DinDinDecor, it was the perfect touch for this sweet birthday! The celebration was held at Georgell Doll Shop at Gardner Village and it was a little hot the day of the party, especially for a September day in Utah! But… heat is always better than rain when it comes to an outdoor event. Luckily, everyone enjoyed themselves and made it through. Two days later it rained 3 straight days in a row, so at least it didn’t rain on party day! 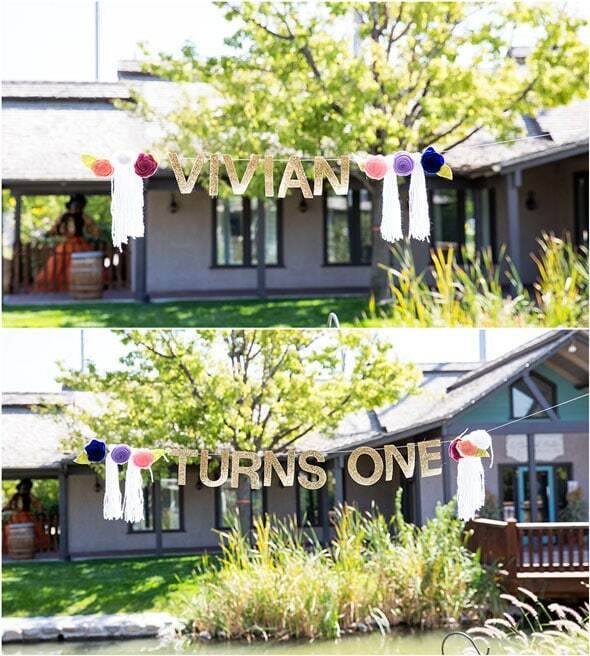 The gorgeous birthday banner was provided by Little Dovie. We absolutely love how it’s customized for this birthday girl and glittery letters are the absolute best for any birthday party! And those gorgeous flower garland pieces? Oh my! 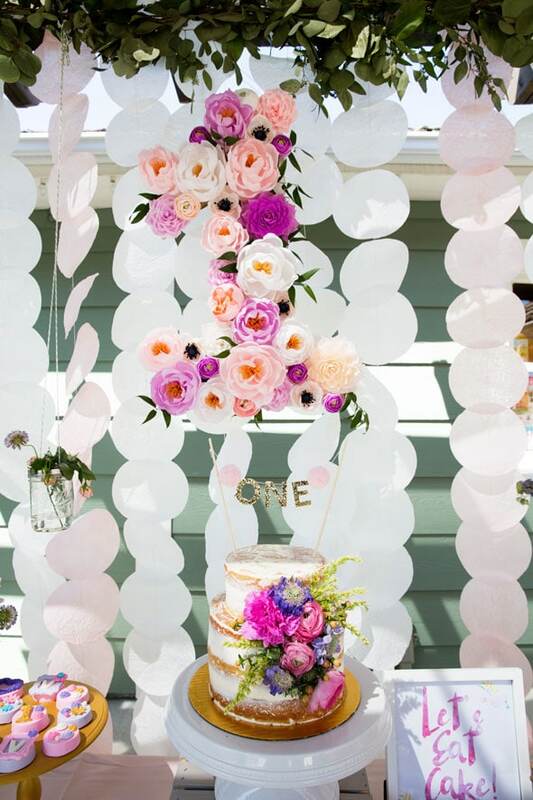 KMHallberg Design really outdid themselves with the exquisite flower creations that were placed around the birthday party. Yum! 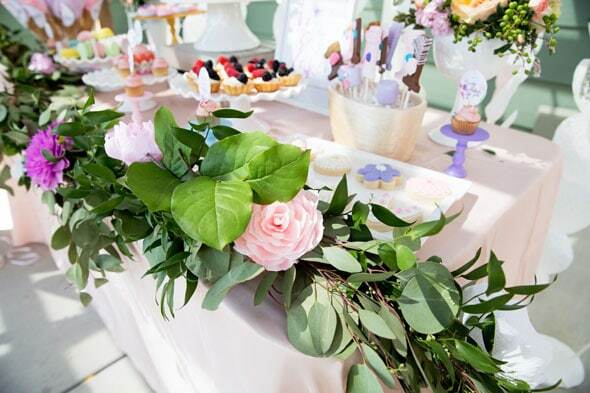 This dessert table had everyone hoping they’d get to dig in sooner, rather than later! 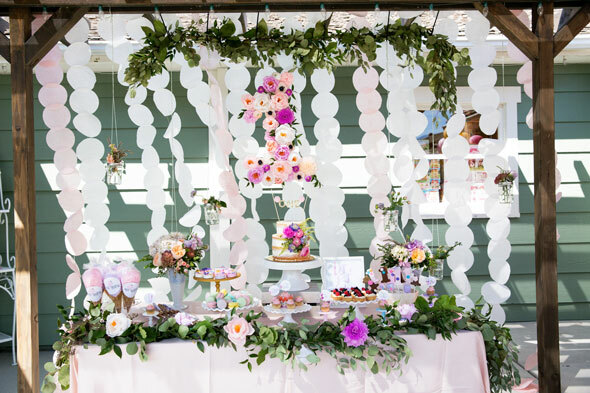 The paper circle backdrop from KMHallberg Design was the perfect complement to the entire table and had everyone commenting about how perfect the entire event was styled! Birthday treats were available to everyone who came hungry! Fruit tarts, macaroons, and cupcakes were made by Sprinkle and Dash and definitely didn’t disappoint! And what about those sweet sugar cookies?! The Fix Utah was responsible for those incredibly decorated treats. 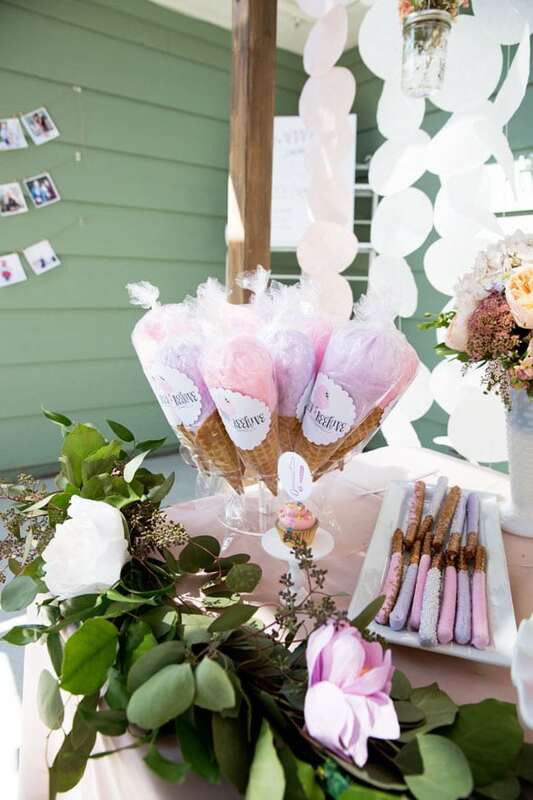 Everyone (particularly the little ones) totally fell in love with the cotton candy from Pink Beehive Cotton Candy. How adorable to have it served in waffle cones?! Finally, the chocolate desserts and pretzels from Summer Time Sweets were the perfect complement to the rest of the incredible dessert table. A job well done for this awesome birthday party! Guests were left talking about how great it was for days! Don’t forget about the cake for this birthday girl! 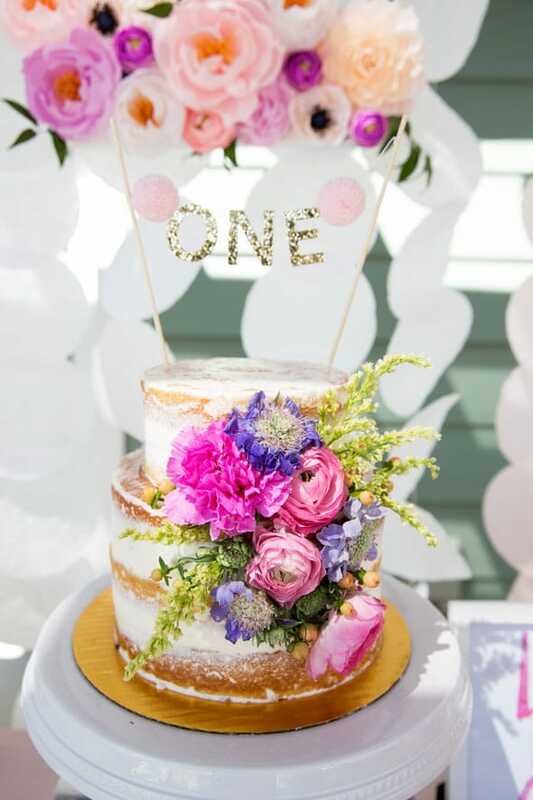 Created by Sprinkle and Dash, it was a gorgeous simple, yet tasty cake that fit in with the garden party theme beautifully. 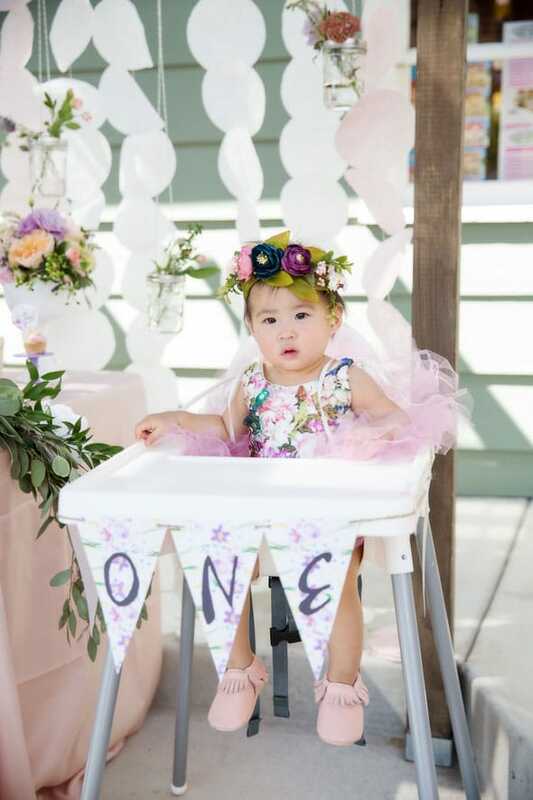 The cake topper was made by Little Dovie and was so fitting for this little girl’s Number One birthday! 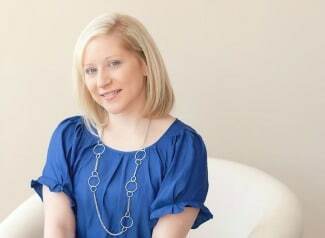 We love this simple idea that has been a big trend item right now! Getting ready to eat your first birthday cake doesn’t get much more stylish than this! 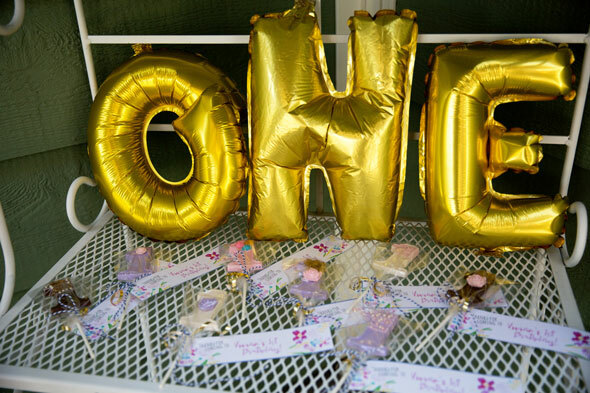 The O-N-E banner from The Lovely Ave was a great item to throw on the birthday girl’s high chair! Time to dig in! 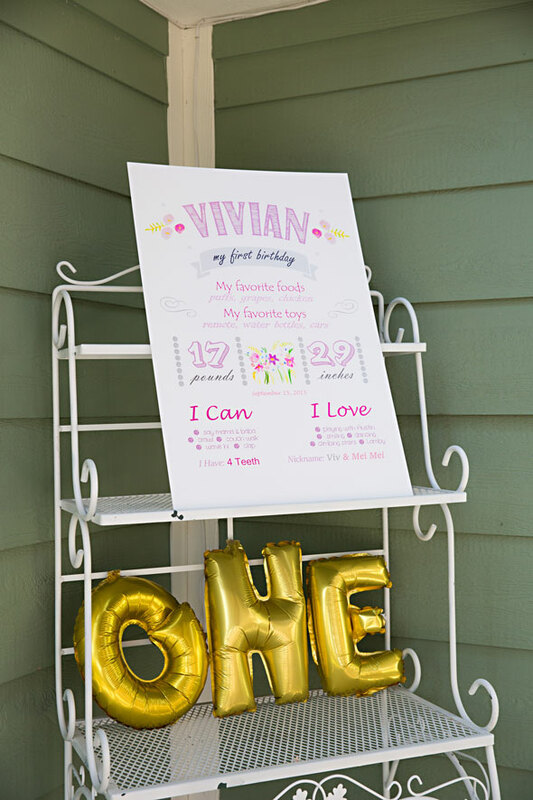 Birthday signs are such a great addition to any child’s birthday party. Who doesn’t love seeing all of the fun milestones that have been accomplished over the last year! Pearl Pear Designs created this sweet birthday chalkboard and everyone had to make sure they took their turn reading all about the birthday girl. 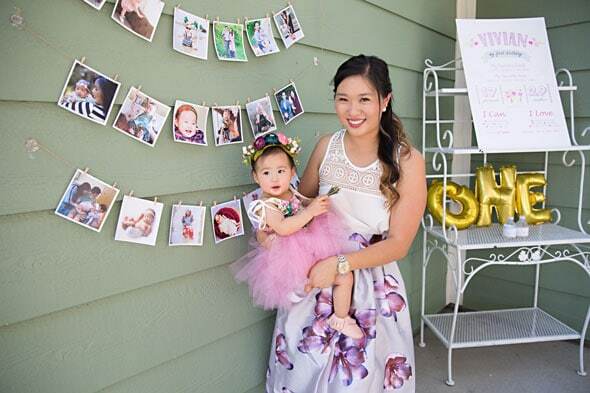 This sweet birthday party included a fun game that is a Chinese tradition. People pick items that relate to certain professions and whatever the baby picks will determine their future! How cute! For example, a ball would mean an athlete, an abacus means a mathematician, a necklace could mean a fashion designer, etc. This little birthday girl? She picked the ball, which she quickly dropped and then proceeded to pick up some money. Smart girl! Nothing could spoil this absolutely perfect party! That first year goes so fast with a little one and it’s amazing for friends and family to see just how much that little beauty has grown in a year! 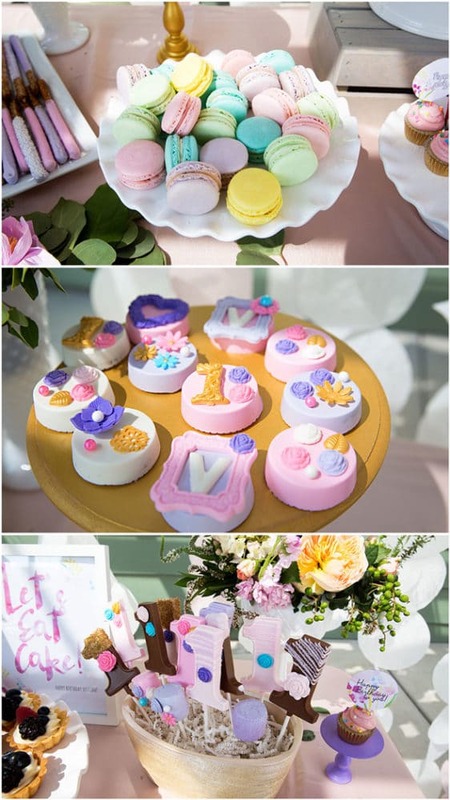 What a great idea for a birthday extravaganza for an adorable baby girl! 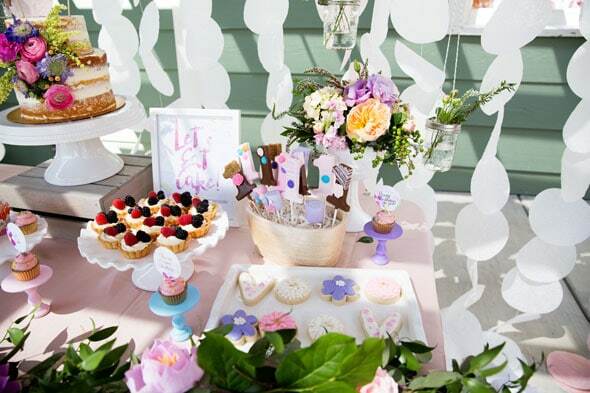 Plan a fun 1st Birthday Garden Party event with these fun and stylish party products!